Hi! 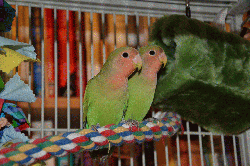 We are Peach-faced lovebird siblings, but we act like we are in love. We snuggle and chirp together. Our human mom let our own mom and dad be together and guess what? Here we are! We also have another baby brother named Baby. He has to be in a separate cage `cause we pick on him sometimes. Sadly, our human mom didn`t want to keep us so the folks at Mickaboo took us in and now we`re in an awesome foster home. Our foster mom is feeding us good food (pellets and greens) and she got us this great tent to sleep in but we like to sleep on it too. Now we are looking for you to give us a forever home. We promise to brighten your lives with our happy chatter, but not all day long; we are quiet during our afternoon siesta. If you have not had a lovebird in your life, you are really missing out. We are just too cute!